The Seated Liberty design was first seen on the silver dollar in 1836, joined soon thereafter on all other silver coinage. The half dollar was the last denomination to bear the design, starting in late 1839. The Seated Liberty look was sculpted by Mint Engraver Christian Gobrecht, featuring the figure of Lady Liberty seated upon a rock, holding a shield with her right hand, as a sign of national readiness. In her left, she grasped a pole topped off by a liberty cap. In an era when much of the world was subjected to tyranny, this was a sign that most Americans lived in freedom. Seated Liberty coinage remained in active production for many years, during which time the United States matured from a post-colonial mentality to a mighty nation spanning from coast to coast, even while enduring a horrific civil war in the 1860's. The final Seated Liberty coins were minted in 1891. 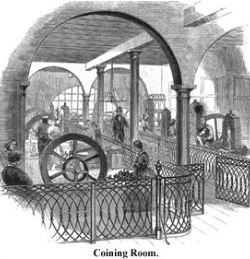 A view of the Coining Room at the Philadelphia Mint in 1861. A passageway in the middle of the room is separated from the machines on both sides by a neat iron fence. Visitors can see every thing from this passageway. There are eight presses, all turned by a steam engine at the further end of the room. These machines produced millions of Seated Liberty coins. This image appeared in a feature article on coin making in the Dec 1861 edition of Harpers Magazine. There are a few legendary rarities in the Seated Liberty Half Dollar series. Fewer than five of the 1853-O No Arrow or Rays variety are known to exist. One example came onto the October 2006 marketplace in VF-35 and sold for $368,000. A single example of the 1866 No Motto half dollar was minted, and has a similar history to the No Motto quarter and silver dollar. The 1878-S is another virtually unobtainable Seated Liberty Half Dollar. Uncirculated specimens can bring about $100,000. Finally, there is the lone 1861-O "Proof" half dollar, a Civil War relic with a unique history. We have the its story here. One Seated Liberty Half Dollar has long held the fascination of numismatists, but for different reasons. Strangely, Mint records show that 5000 of the 1873-S No Arrows half dollars were coined, but no examples are known. Their fate remains a mystery to this very day. We could have listed perhaps a few more worthy dates (all of the Carson City dates are tempting), but we settled on these because of their superior records of value increases. 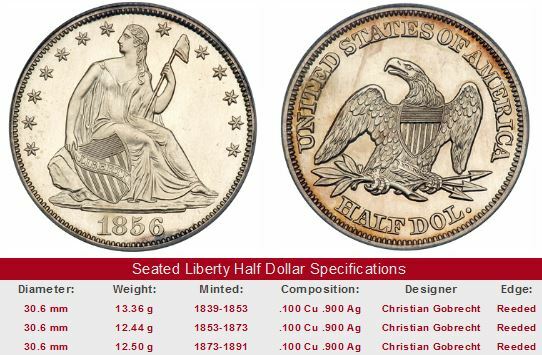 Not many half dollars were minted at Philadelphia from 1878 to 1890, because the law requiring vast numbers of Morgan Silver Dollars diverted much of the Mint's resources away from smaller silver coin production. All of them are rare and evoke passion from collectors. Key date Seated Liberty Half Dollars are offered for sale below, via links to eBay U.S. coin auctions. The left hand side of each "Sales Box" is value trend data over a very long period of time for a coin of that date in Good-4 condition. The percent annual increase is computed for comparative purposes. The 1879-90 box brings up all half dollar auctions within this date range. The date 1886 was chosen for the trend analysis as a representative sample of the group. The coin pictured for sale in the right hand side, if any, is not necessarily the same condition coin as that represented in the value trend analysis on left hand side.